Given daily news events, it comes as little wonder that Americans are drinking more than ever. Amid hurricanes, a vanished journalist, the recent Supreme Court hearings, midterms and “mobs,” it is little wonder that Americans are drinking more than ever. I mention these stats for context. Lately, at least from my perch on the porch, the evening cocktail has become less an aperitif than a medicinal slug made necessary by the alternative of ripping off my face. To bear witness to These Times In Which We Live is to go insane, join a cult or pour your favorite poison. Please, if you haven’t strayed from the wagon, do not feel compelled to share. We’ve had enough scolding from Democrats lately, which is another point of cognitive dissonance. The Democratic Party, once a haven for working-class Americans, has become a green room of shaggy intellectuals who lecture the nation about the decline in morality and civility. Ostensibly, he was there to discuss prison reform and plead for clemency for Larry Hoover, a convicted murderer and gang kingpin. 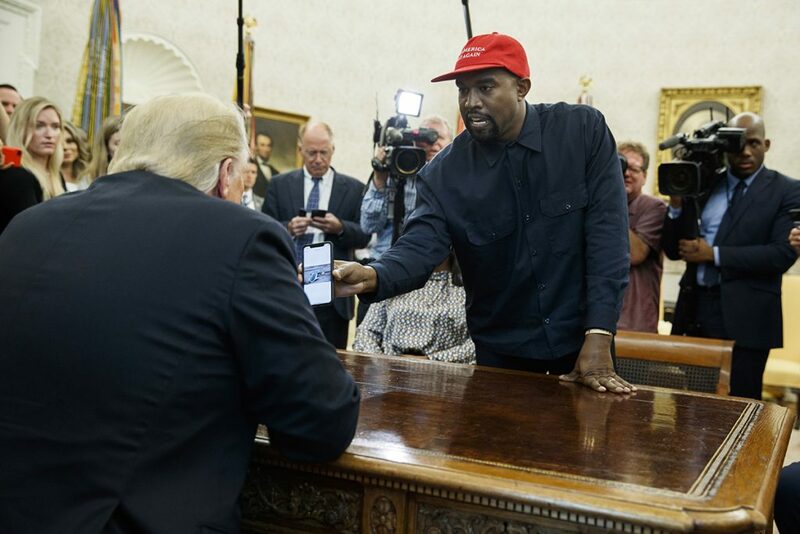 Instead, the rapper embarked on a disjointed, stream-of-consciousness lecture with such rapid-fire madness that one half-expected he might forget that his “Make America Great Again” cap wasn’t really the Superman cape he thought it was, plunge through the window fully expecting to fly. Among other topical points, West mentioned that Hillary Clinton and her “I’m With Her” slogan didn’t do it for him in 2016 because he was a child of separated parents and didn’t get enough father time. (This is perhaps the most interesting and true thing he said.) Thus, West went with Trump and is proud to be an African-American supporter of the president. He said he loves Trump and offered some choice expletives for emphasis. His performance was, shall we say, head-swiveling and definitely alternative universe-ish. Throughout the 10-minute speech, Trump remained nearly mute and interchangeably bemused and, just possibly, terrified. Toward the end, his arms folded tightly across his chest, he nodded and said, “Really very interesting.” Meanwhile, serious news of enormous import loitered in the vestibule awaiting the president’s attention. Hurricane Michael had recently finished decimating the Florida Panhandle and, on the very day of this epic confab, was drenching the Carolinas, which were still foundering from Hurricane Florence. When the world has gone barking mad, when high school yearbook jottings can nearly take a good man down, when a hip-hop artist and the president convene a surreality show in the Oval Office, when millions are suffering the aftermath of a killer storm and Trump seems chillingly unmoved by a reporter’s alleged murder – well, you’d best make mine a triple.